Enjoy this beautiful rental home on your next North Shore vacation. Comfort combined with aesthetic creativity were built into this new Prairie Craftsman style home, featuring 3 bedrooms and 2 bathrooms. 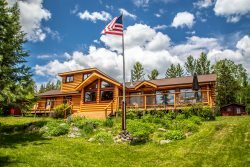 Located on a peaceful stretch of Lake Superior shoreline, you will love this quiet wooded setting. A tasteful, relaxing retreat - so comfortable you won't want to leave. There is an open floor plan on the main level with a gas fireplace in the living room. Never miss a moment with your friends and family, while enjoying your North Shore vacation at North Haven. Of course if your goal was to just show up and relax, you have definitely come to the right place! You will have 200 feet of private cobblestone and ledge rock Lake Superior shoreline to enjoy. Sit out on the lake-facing deck with a good book and a cup of coffee and enjoy the peaceful ambiance of this northern retreat. Come for 3 days or come for 3 weeks, either way, you will love this home and never want to leave. There is a 3 night minimum at this family friendly property. No hassles and it was nice to receive an email asking if all ok. in the past they have been responsive to issues. Very comfortable house close to Tofte/Lutsen area. Fully stocked with everything we needed and with good lake access. Our group of 5 was happy with three bedrooms and two baths. Private and no or little noise from neighboring properties. We've rented houses with you since about 1995. In recent years the process has improved and tightened up which has made it easier. Phone calls and emails have been handled efficiently. We have rented this house for about 12 years. Good location, easy access to the lake, view of the lake from all rooms. Like having the lock box for easy initial entry. This year Netflicks was added which was nice in the evening - there is no regular TV access. The house is well equipped overall. Like having the decks at the house and the deck next to the lake. We had a great stay and experience at North Haven. The cabin was very nice and had anything that you could want or need for a stay on the north shore. The firepit and picnic table overlooking the lake were perfect and the location of the cabin allowed easy trips to many north shore destinations. The home was beautiful and our stay was perfect. The home is very comfortable, nicely furnished and well supplied with cooking utensils, Weber kettle etc. Beautiful setting on Lake Superior. While we prefer something closer to Lutsen and Grand Marais we like this property so well that we are willing to make the drive.